This weekend is a somber one for our country, and especially for those of my glorious city. Time is such a fickle thing – at some points seeming so fleeting and delicate, a paper crane crushed in a child’s ecstatic palm. Yet a dark night can stretch on for what seems like a year, and goals and dreams can seem so inevitably far away. Ten years have passed since September 11, 2001, and how the world has changed for so many people. This post is part of Frosting for the Cause, an online baking event that connects bakers from all over the world with womens cancer charities. 365 days a year, a blogger posts a recipe on the site, as well as shares a story of someone they know who has been affected by cancer. They then make a small monetary donation to a cancer organization and bring the baked goods to a local cancer shelter. Because my posting date fell on September 11th and I love my city Paula, the wonderful woman who runs the site, allowed me to stretch the rules of the post a bit and focus it around how 9/11 has caused cancer amongst the first responders who had spent much time around Ground Zero in the months and years following the collapse of the towers. Hundreds of first responders – firemen, police officers, medics – died on that day. But since then that community has seen a large increase in serious chronic illnesses, and not all respiratory illnesses, as you might expect. Many are developing serious cancers – melanoma and lymphoma specifically. Hundreds have been diagnosed: in fact, first responders who worked at Ground Zero following the collapse are 19% more likely to develop serious cancers within the first 7 years of repeated exposure to the environment of Ground Zero. The toxic dust that was in the air for months after the collapse is the cause, though the Environmental Protection Agency won’t conclude that the mixture of non-fibrous materials, asbestos, glass, lead, cadmium and other toxins is the link between. Asbestos is highly carcinogenic, and a report from HP Environmental, a firm from Virginia, found that the asbestos was so pulvarized it was literally just too small to show up on the EPA’s tests. Debates have gone back and forth, but the reality for first responders and their families is this: they saved lives by rushing people out of buildings, mining them out from under the rubble, and helping to clean up the wreckage. And they’re paying for it – both with their own money and their lives. This is Roy Chelsen. He was a “Viking” of a firefighter, one so strong that he could hold a blasting hose that would usually take two men to control. 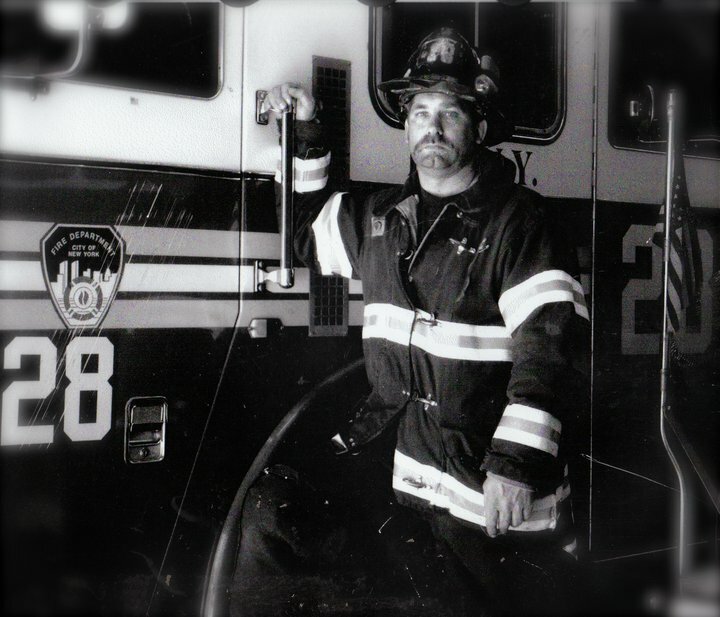 Quiet and somber, he did his job well and love his company, Engine Company 28. “To say he loved it is an understatement” his son Christopher said. His company rushed to the first tower and started evacuating civilians at 1 World Trade Center. But a point came when Roy knew that the second tower would begin falling, and he commanded his colleagues to get the last people they could and evacuate. They made it to under a nearby bridge as bodies started falling, and when the tower collapsed were able to run to safety. Many firefighters and civilians credit Chelsen with saving their lives – though he was so humble about his affect that day that few knew of this during his life. Roy died on January 9, 2001. 1/9/11 – an almost bittersweet set of numbers. He died of multiple myeloma, a serious blood cancer that requires bone marrow transplants along with a rigorous regimen for treatment. He had finally received a match and had a stem cell transplant only a month before he died: doctors believe all those who donated blood in hopes of matching with his saved other lives through their donations, and will continue to do so. As of now first responders do not get their cancer costs covered by the 9/11 Victim Compensation Fund, a fund that has allotted more than $7 billion in funds over the last ten years and now is working with about $2.8 billion. While the Zagroba bill (named for James Zagroba, a police detective who died of 9/11 related illness) was signed into law in January to follow up on and in some cases cover medical bills for those suffering from toxicity related to 9/11, there needs to be overwhelming scientific proof in order to get “cancer” put on the list of applicable illnesses. John Feal doesn’t need scientific proof to know the connection is there: “I’ve been to 54 funerals. 52 of them were 9-11 cancer,” Feal said recently at town hall meeting held by the 9/11 Compensation Fund. He heads up the Feal Good Foundation, an advocacy group for first responders, and was instrumental in getting the Zagroba bill signed. While certain other factors obviously play into how and why someone gets cancer – age, genetics, lifestyle – there is little doubt that working through the toxic rubble of Ground Zero has increased the chances for first responders, and that they should get compensated for it. They’re getting cancers at young ages, and dying from them quickly. For my monetary donation for Frosting for the Cause, I am proud to donate to John’s efforts at the Feal Good Foundation. Since his own injury at Ground Zero – 8,000 pounds of steel fell on his foot, causing a partial amputation and years of therapy – he has been a stalwart in teaching others how to advocate for their own rights. Those who need the help are mostly blue-collar, hard-working, physical people, and John is the perfect spokesman for them. He is out there, every day, challenging unjust laws and educating politicians, so that first responders who risked their lives to save others and clean up the literal mess that is Ground Zero don’t continue to suffer alone. Several friends have mentioned that they’d like to contribute to an organization in honor of those lost on September 11th. If you’d like to join your little Dusty Baker and Frosting for the Cause in supporting the Feal Good Foundation, CLICK HERE or on the image above to donate. I consulted John as to where my baked goods should go and he responded: “the 10 House next to GZ would be the perfect gesture. They lost so many people that horrible day.” On September 11 2001, they lost a captain, two lieutenants and 3 firefighters. 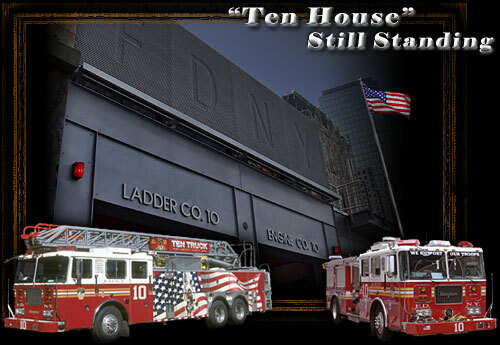 The Officers and Members of FDNY Engine Company 10 and FDNY Ladder Company 10 would like to express our sincere thanks to all those that have supported us and continue to show your appreciation. Words can not adequately express our feelings of gratitude for the tremendous outpouring of support. Maybe you contributed in our efforts to support the families of our lost Brothers or maybe you stopped by just to say Hi! Maybe you waved or smiled as we drove by on the streets. We join the thousands of other FDNY Firefighters serving New York City from more than 200 Firehouses in saying we are truly grateful to all. I’m a little in love with any firefighter who can quote Shakespeare, frankly. Thursday I trekked down with 2 dozen Big Apple Cupcakes to the Ten House, which sits literally next to the gaping hole we call Ground Zero. It was already packed with tourists, many who wanted to see the inside of the fire house, and the man who answered the door looked calm but slightly exhausted amongst the chaos. I handed him my package, gave a quick little introduction as to what I was doing, pointed out that my info was in the bag, shook his hand, received a warm smile, and went on my way. It wasn’t my intention to add any more chaos to the scene, just to drop off something sweet. They were very sweet and humble in their appreciation. I am thankful they continue to serve my city, open their house to those who want to see it, and offer them my prayers, thanks and love. I’m going to warn you, this is not the quickest recipe to make. And I can’t even promise that it’s the best cupcake I’ve ever made because I didn’t get to taste them – the batter made 24 exactly, and because they contained dairy and gluten I wasn’t going to risk sampling. But the parts I could taste were rather delicious, and they looked and felt wonderful. I made the two batches of 12 only slightly different (the second had a bit less fat and calories in the cake) but in most respect the content was the same. Though I’d consulted it often when adapting recipes, I had never directly made a recipe from The Joy of Baking before. These tested recipes are known for being rather simple and straightforward and foolproof! 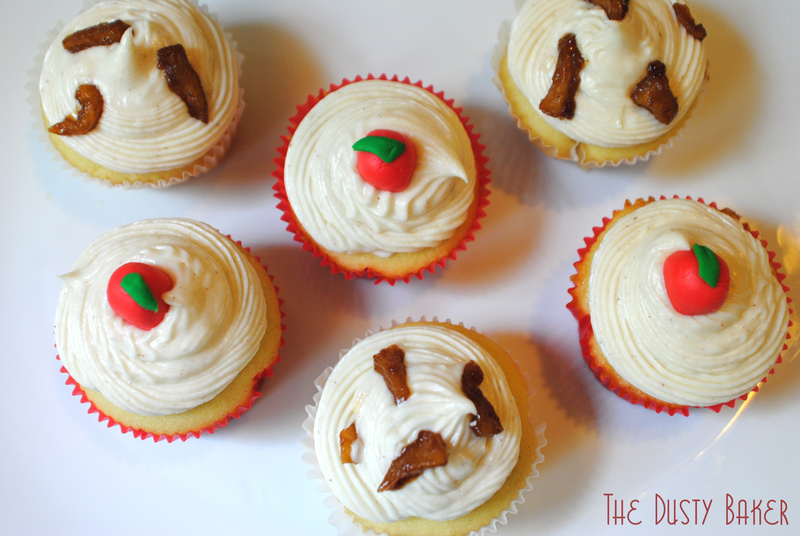 I chose a basic vanilla cupcake thinking it would best compliment the apple pie filling and cheesecake frosting. I made the first batch according to plan, and simply replaced the butter with Earth Balance and cut the sugar for the second batch. Click here for the recipe I used, or have fun with your old favorite. 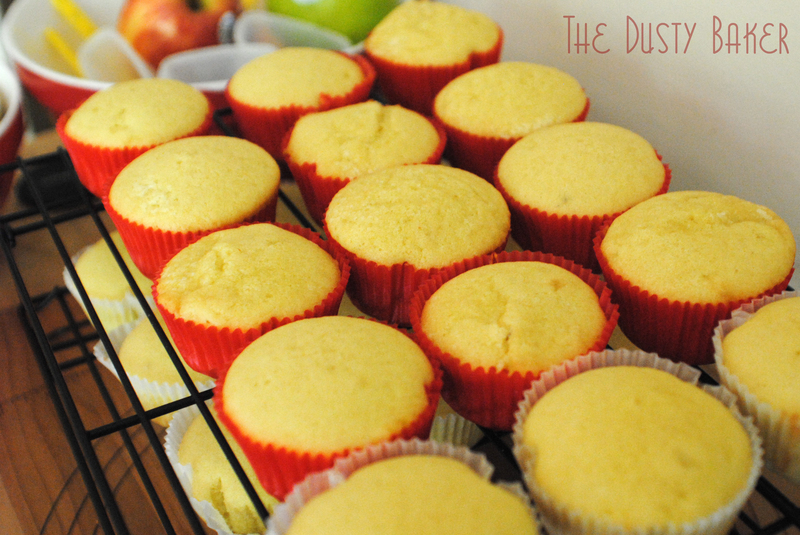 Just make 24 awesome vanilla cupcakes. I made an easy apple pie filling on the stove top – using just a little maple syrup and apple juice, it was incredibly sweet. Sauteing it for a while and then letting it cool completely made sure it gelled correctly and that the spices had time to settle a bit. Place the apples in a medium nonstick pan over medium-low heat. Add the spices and mix well, then add the maple syrup. Cook until the mixture is bubbly and the apples begin to soften. Then add the apple juice and sprinkle on the gelatin. Let the gelatin sit until it is absorbed, then continue to stir the apples as the liquid boils down and the mixture softens completely. When golden-colored and almost dry, remove from heat and chill until completely cooled. If you don’t have gelatin on hand (or just prefer not to use it) you can mix a tsp or so of tapioca starch in with some cold apple juice before pouring it over. It will give you a slightly different texture but will help to pull some of the moisture together. 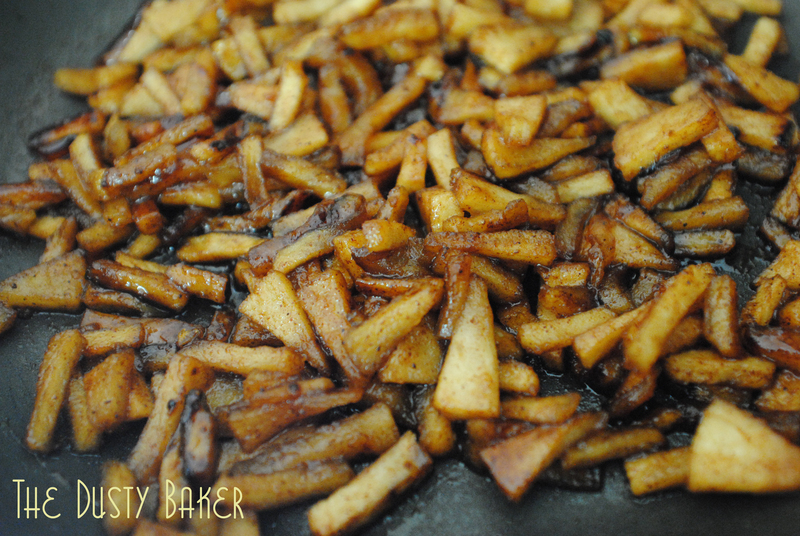 Or you can just omit completely and use slightly drier apples. This frosting is only slightly sweet and laced with cinnamon and nutmeg – too sweet and it would completely overwhelm the cake and pie filling flavors. It’s super easy to make but does need to be cold in order to pipe clearly and retain its shape. This was not exactly easy on the warm and humid NYC afternoon during which I was piping away and trekking on the hot subways. Oh well. I used a large pastry bag with a large star tip on the end to pipe my frosting. But if you don’t have a pastry bag set or just hate piping, you can easily just swipe the frosting on with a small spatula. Or you can cut the corner out of a plastic ziplock bag to pipe it on. In the bowl of a standing mixer with the beater attachment (or with a hand mixer) beat the cream cheese and butter together until smooth and fluffy, about 2 minutes. Add the powdered sugar a cup at a time, sifting as you go. Once you’ve mixed in all four cups, test the flavor. If you want it sweeter or with a thicker consistency, add more sugar a 1/4 cup at a time. 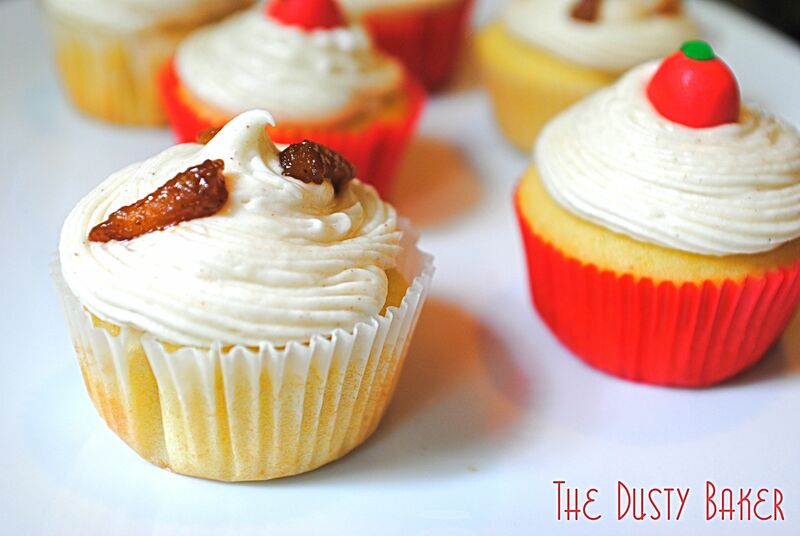 When at the proper level of sweetness and flavor, add the vanilla, cinnamon and nutmeg. Beat to combine. Fill into a large pastry bag and place in refrigerator to chill until ready to frost. 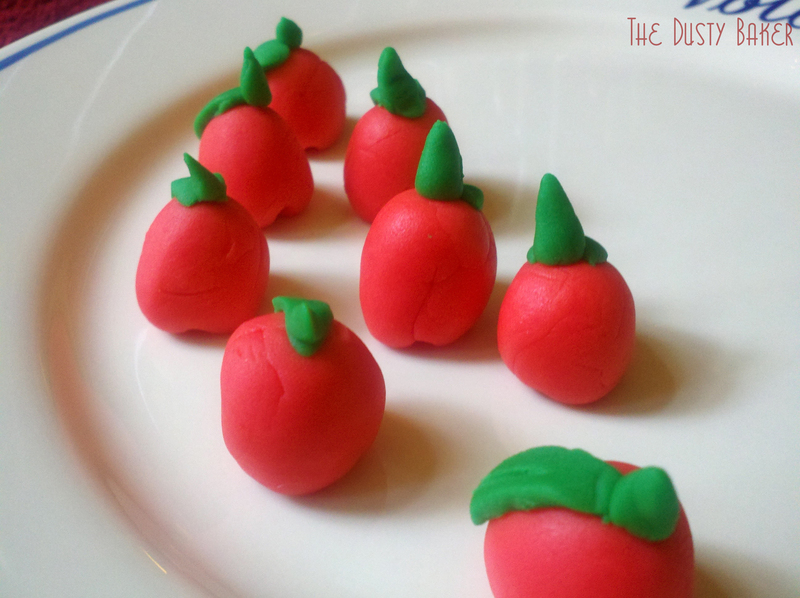 I must admit, this was my first time using fondant (gasp!) and boy was it fun. It brought back to mind my art teaching days, where I made homemade play dough and colored it with my hands. Instead of making my own fondant, which is an art in its own, I bought some ready-made from Wilton and used my trusty gel colors to get the red and green hues I wanted. Warning: if you use too much green coloring the majority will end up embedded in your fingernails, making it perfect if you want to audition for Elphaba in Wicked. Which I don’t particularly but it was fun to think about. 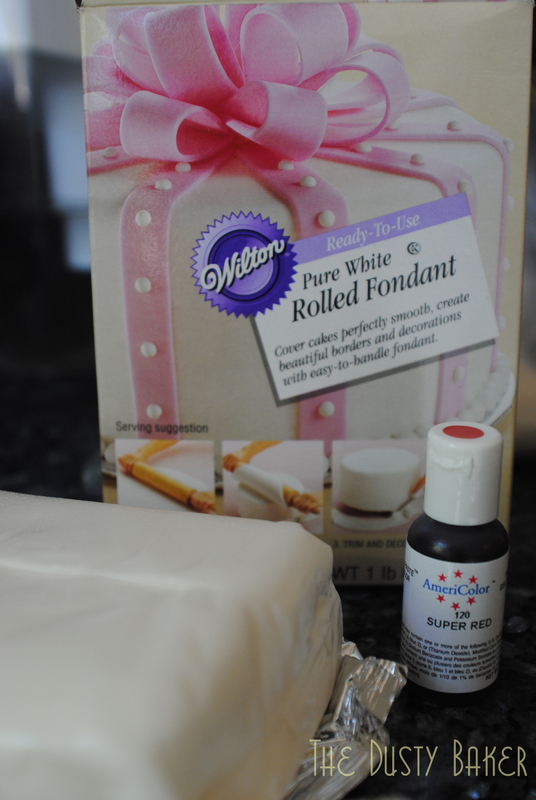 I simply pulled off a good-sized piece of fondant, rolled it flat with a rolling-pin, added about 3 drops of red gel and started working it in with my hands like a happy kindergartener. I then did the same with the green (Elphaba!). Working it with the heat of my hands kept it moist so that I could roll the red into balls, shape the bottom with a toothpick and top them with little leaves I had cut out of the green. Yes, they look like something my kindergarten self could have made – but on top of the cupcakes they made the right impression. 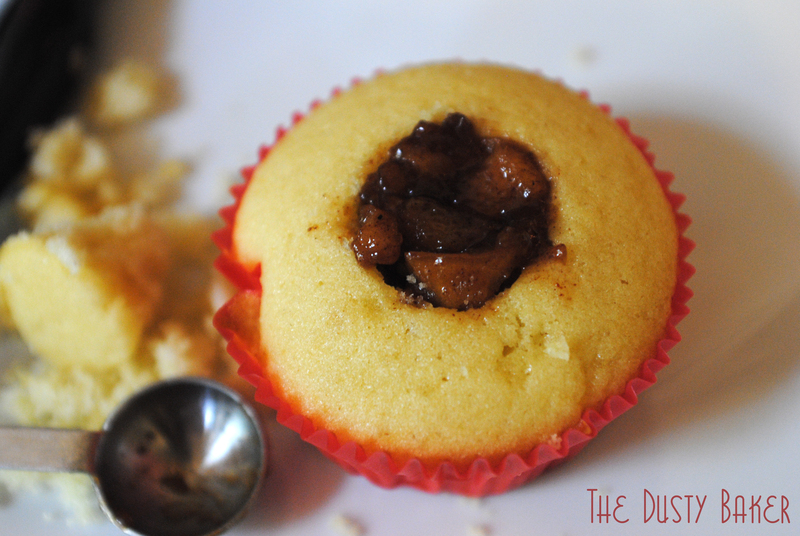 I used a tiny espresso spoon to scoop out about a teaspoon size hole in the cupcakes and filled with the cool filling. 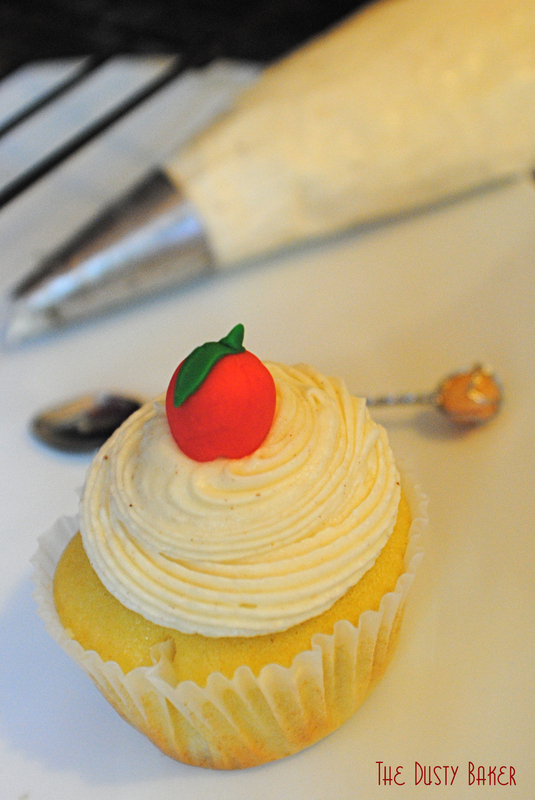 Then a swirly piping of frosting and an apple – voila! Cupcakes ready for hungry firefighters! Thank you to: Paula at Frosting for the Cause, John at the Feal Good Foundation and the men and women of the FDNY Ten House for allowing me to create this recipe for them. Thank you for sharing your comments, retweeting this post on twitter, and sharing it with friends. 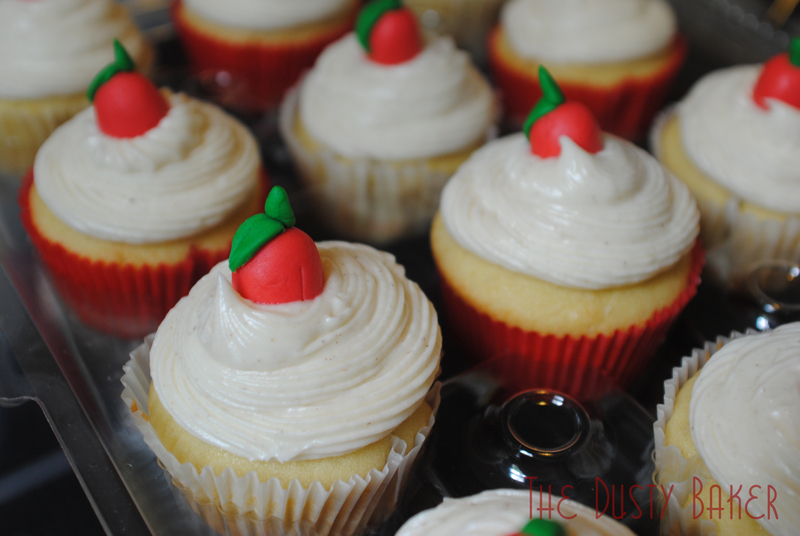 And please click on Frosting for the Cause so that site gets the traffic it deserves today too! I’m also stepping in on Frosting for the Cause on Thursday, September 15th for a blogger who had to back out. My Pink Ribbon Cookies to Cure Cancer and stories about my walking with the Susan G. Komen 3-Day for the Cure will be posted then – please check it out! For more information on how cancer is affecting first responders, the Feal Good Foundation and Frosting for the Cause, please check out the links below.